A selection of well-loved tales from Chaucer's literary masterpiece retold in humorous comic-strip style. Travel back to Medieval England and join Chaucer and his band of Canterbury pilgrims in this wonderful introduction to one of Britain's greatest literary legacies. 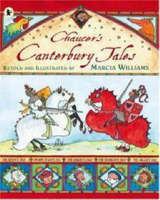 These nine well-loved tales, from a host of colourful characters - the Knight, the Miller, the Reeve, the Wife of Bath, the Summoner, the Clerk, the Franklin, the Pardoner and the Nun's Priest - are brought to life with Marcia Williams' trademark witty, comic-strip art, allowing this classic text to be enjoyed by all ages.